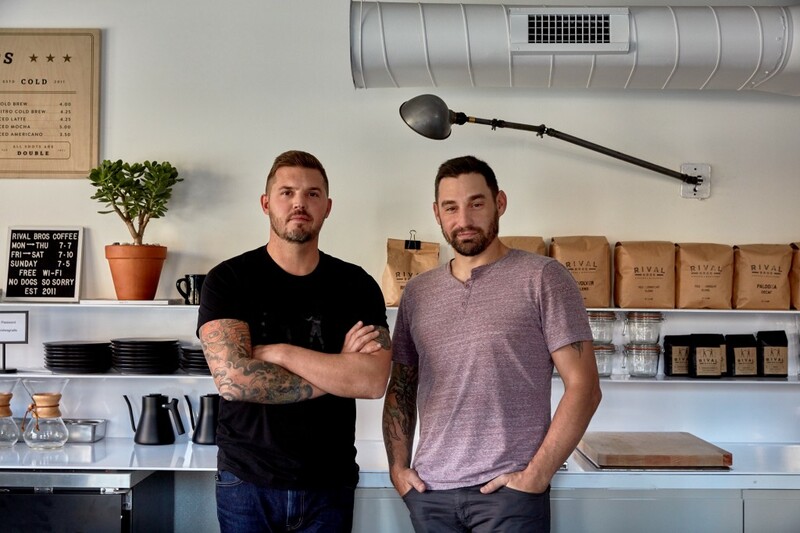 Rival Bros Coffee owners Jonathan Adams and Damien Pileggi. Several South Philly-based restaurants participated in the Nov. 15 Bridget Foy Fire Relief Benefit hosted by the South Street Headhouse Business District in partnership with the Queen Village Neighbors Association. It was held to support the popular spot at Second and South streets that was destroyed in a two-alarm fire on Oct. 25. Brauhaus Schmitz, 718 South St., Hawthornes Beer Cafe, 738 S. 11th St., Kanella South, 757 S. Front St., P’unk Burger, 1823 E. Passyunk Ave., SliCE, 1180 S. 10th St., Tap Room on 19th, 19th and Ritner streets, and Whetstone, 700 S. 5th St., joined forces with establishments from Center City, Old City and Fishtown for this culinary sampling event. The community event was held to raise funds for Bridget Foy’s displaced employees, Saved Me Inc. animal rescue and the American Red Cross/Red Paws. Rival Bros Coffee, 1110 Tasker St., opened its third location on Nov. 3. The hours are 7 a.m.-7 p.m. Monday through Thursday, 7 a.m.-10 p.m. Friday and Saturday and 7 a.m.-5 p.m. Sunday. Besides coffee, the food menu includes a variety of baked goods and breads from High Street on Market, as well as an assortment of pastries from the Machine Shop Boulangerie, which will be baked fresh daily. Peanut butter toast (anadama bread with peanut butter, dried figs, maple syrup and vanilla salt), “Cubano style” sandwich (potato bread with classic cured ham, Swiss cheese, kosher pickles and mustard mayonnaise) and the daily bread (potato bread with organic and grass-fed butter, sea salt and fruit preserves) are a few of the items available for purchase. Guests may enjoy complimentary WiFi, and outdoor seating will be available weather permitting. For more information, visit rivalbros.com. ..
With Thanksgiving fast approaching, holiday hosts are putting together the menu for the big feast with family and friends. For those who are still finalizing the dessert menu, the Hungry Pigeon, 743 S. 4th St., is taking pie orders through Friday (Nov. 17) at 11 p.m. The options are heirloom pumpkin pie, three springs farm apple pie and Pennsylvania maple pecan pie. Pick-up dates are Nov. 21 and 22 from noon to 6 p.m. Call 215–278–2736 or email info@hungrypigeon.com to place your order. Have restaurant news to share? Email news@southphillyreview.com.